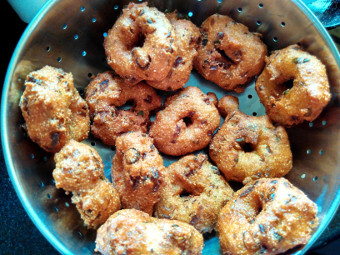 This 'Instant Rava vada or semolina fritters recipe' is a easy breakfast or snack recipe. 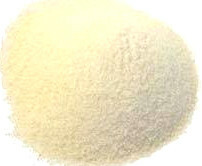 Ingredients are usually available in the kitchen and it takes about 30 minutes or less to make. When you have guests, you can make these yummy sooji vadas for them too. Kids love these as a snack when they return from school. 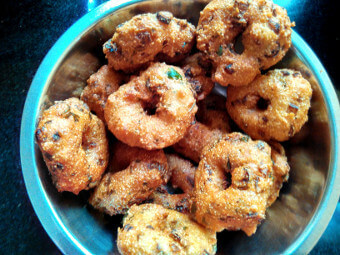 Rava vada is to be enjoyed hot and when it is crisp. At room temperature, it may lose it's crispiness but is still yummy. It is good to eat for 1-2 days. It is a wonderful snack item. It is a good addition to your picnic basket too. You can follow this rava - sooji vada recipe to make them in your kitchen and enjoy. Green chilies - 2 or more according to taste. Curry leaves - 1 tbsp chopped fine. 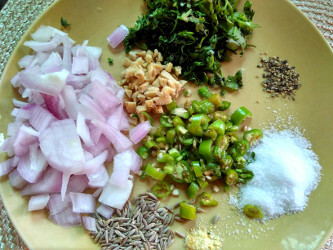 These below here, are the ingredients to add to the rava vada batter. You can see chopped onion, chopped chili, chopped ginger, chopped coriander leaves, crushed black pepper, salt, hing, cumin seeds (jeera). Baking soda in not in the image. I forgot to add it before taking photo. 2. 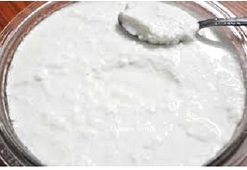 Place rava/sooji to a bowl and add curd/yogurt to it. Mix well with a spoon or your fingers. 3. Add all the ingredients, onion, chili, ginger, salt etc. to the rava batter. It will be thick now. Do not add any water now. 4. 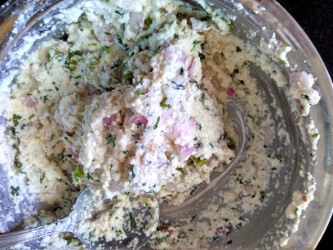 Mix all the ingredients with the rava/curd mixture and keep aside for 15-20 minutes. 5. 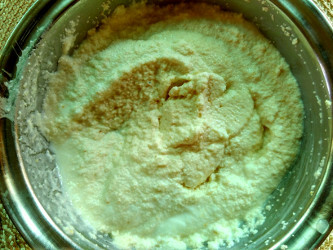 After 15-20 minutes mix the batter again and check consistency. We need a thick but soft batter. If needed, add a tablespoonful water and mix. 6. Heat oil well and add 2 tbsp hot oil to the sooji batter and mix well. You may add a pinch of baking soda instead of adding hot oil. This will make the vadas crispy. 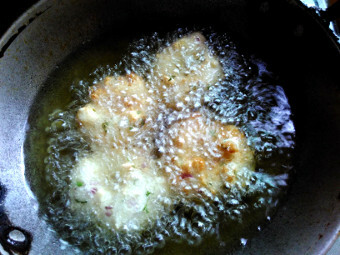 You can see in the image the process of making rava vada after the dough is ready. Heat oil in a kadai in which you are going to fry vadas. Once the oil is hot, keep the flame medium. Add a drop of oil on a plastic sheet or a butter paper. Take a ball of dough and place it on the sheet. Lightly pat it into a thick round of about 2 inches. 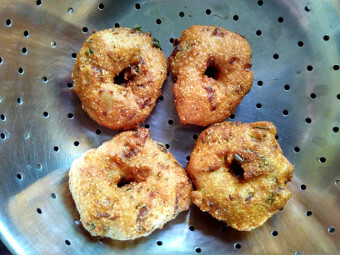 Make a hole in the center of the patted vada. Lift the flattened round (take care the hole remains intact), from the sheet and put in the hot oil. Turn after one side is lightly browned. Fry on both sides till golden brown. Drain well by adding on a colander or place on absorbent paper. Let cool completely before storing. It will be good to eat for 2-3 days. Too watery batter will not let you form the shape of the vada. Too thick batter will make the vada hard. Aloo Bonda - Batata vada- A chickpea flour and potato snack. Fruit snacks Fried ChickPeas Vegetable Samosa- A Yummy snack. Dhokla- A chickpea flour steamed snack.